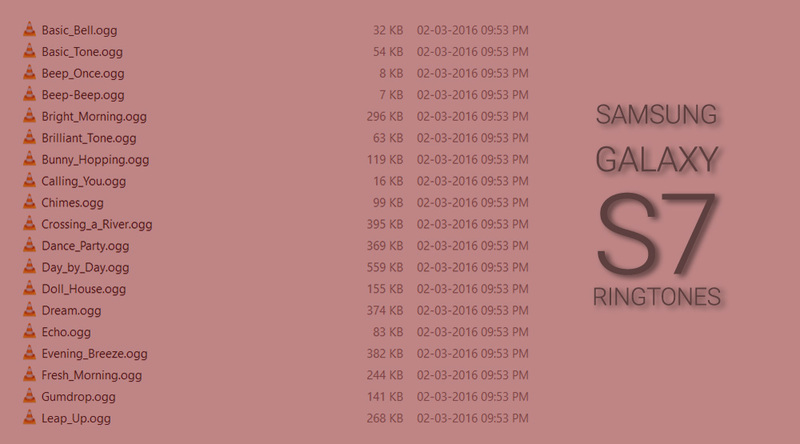 Here is your pack of ringtones from Galaxy S7 (and Galaxy S7 Edge of course). The zip provided below packs in notification tones, alarm tones, UI tones and ringtones as found on the Galaxy S7 pre-installed. This is another cool grab-from-Galaxy-S7 we’re doing, right after we provided downloads of Galaxy S7 Apps port, that is fully working on Samsung devices running Android 6.0 Marshmallow (that is, Galaxy S6, S6 Edge, S6 Edge Plus and Note 5). There are 30 notification tones, 35 ringtones and 65 UI tones in the pack. Right now, alarm tones are missing but you know us, we will grab them soon for you.